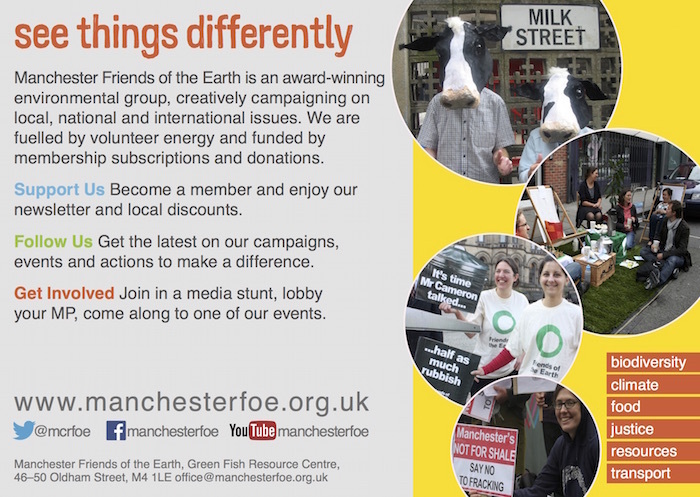 Manchester Friends of the Earth is fuelled by volunteer energy. By getting involved in the group, you become part of a wider movement in which more and more people are seeing the need for change and taking action to make it happen. Local campaigners actively shape their city for the better. Effective campaigning can challenge the unsustainable use of the world’s resources, give people opportunities to make positive changes, and reduce unjust impacts on communities now and in the future. Campaigning is fun, sociable and rewarding. It’s also a great way to meet people, learn new skills and make a contribution to society. You are very welcome to come along to one of our meetings to find out more about what we do, or simply get in contact. Our Open meetings are good for finding out about our activities generally, and specific campaign meetings are a good starting point if you know what you’re interested in campaigning on. Our meetings are shown on our events calendar. All the meetings on our calendar are open to all. You do not need to be a member. Some members take on positions, such as coordinator, treasurer, membership officer or lead campaigners and we are always keen to hear from people who would like to join us in these roles. Support and training provided! If you’re interested in this, please have a look at the role descriptions and get in touch. What can you expect when volunteering with us? Our events are listed on our calendar. Our Open meeting takes place on the second Tuesday of each month and often has a particular focus such as planning for an event, sharing skills or debating an issue. There are also opportunities during the month to join us in our office to work on campaigns (see our website calendar for dates) and other admin tasks that need attention.. ordering stock and preparing for stalls.. for example. And if you would prefer to support our work from home, there are plenty of online actions on offer! These are listed on this website or please email and ask. Each campaign has a separate meeting once to twice a month, which focuses on current issues and activities relating to that campaign. We might plan an event, discuss how to respond to a consultation, or co-ordinate MP lobbying. All our meetings are fairly relaxed and we make sure we have tea, coffee and snacks to hand. The meetings are chaired to make sure that everyone can input. After our meetings we usually go to a nearby pub to talk more informally. We also have social events throughout the year- films, dinners, walks..